HP: 192, MP: ?, ATK: ?, DEF: ?, EVA: ?, SPD: ? 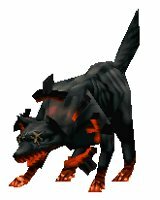 Description: Being a hunter of the highest order, with a body of jet black, and an aura of eldritch ensorcelment, it would chase its quarry to the very gates of the underworld. 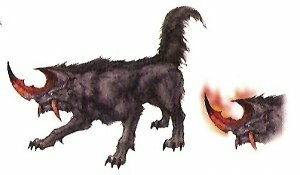 Originally a type of hyena, a steady diet of malign, magicked creatures transmogrified it into what it is today. The sharp horn on its nose and long fangs jutting from its upper jaw are like to arrested magma. When they die, their color fades, becoming naught but dull, black stone.